We are manufacturing finest quality of Bronze Bearing is used in throwing wheel hubs of pitching machines. The part is molded in a rubber mold. The V grooves on the OD increase the surface area, allowing it to better adhere to the rubber mold. The image above show is the part with and without the ID keyway. 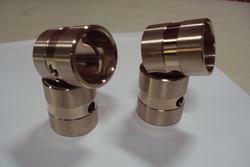 We make C95400 Aluminum Bronze Processed through Turing, Boring and Grooving. 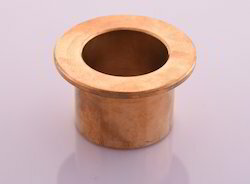 This Aluminum bronze toggle bushing is used in the mechanical toggle assembly of a thermo-forming station. The forming station produces highly detailed parts at high speeds with great consistency. The toggle assembly is one of the three mechanical assemblies that are critical to this thermoformed. They must withstand tremendous force without deflection. The toggles are positioned on the honeycomb platen to eliminate deflection and guarantee consistent material distribution across the mold area. With up to 260 tons of holding force and 150 tons of coining force, C95400 Aluminum Bronze was chosen for its heavier load capacities. A single ID circular groove provides the necessary lubrication distribution to ensure optimal bearing performance. We are manufacturing, exporting and supplying an extensive quality Automobile Bushings. The provided automobile bushing is manufactured using the finest quality raw material and ultra-modern technology in sync with set industry standards. Keeping in mind the different requirements of our patrons, we offer this automobile bushing in different sizes and other specifications. We manufacture Flange Bushing with the premium quality. Bronze metal which are manufactured using the latest equipment, coupled with technically qualified personnel in the industry. Our in house production capacity allows us to produce Flange Bushing in bulk and hence we can supply this at very competitive price with superior quality. BPW Bushing is of Suspension Bushing type. They are positioned from Front. Its main application is in BPW 16 tons, 24tons, 32tons. Mainly Brass & Bronze material is used to make. 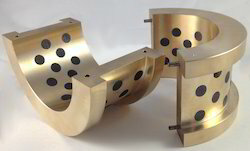 This bush is also can said of Centrifugal Cast bronze with oil grooves type. 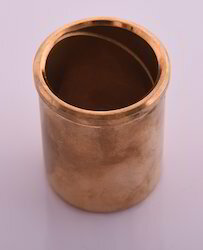 Plain Sliding Bushing is made from T Bronze Alloy + Graphite. It offers various features like; High load capacity, very good wear and abrasion resistance, moderate corrosion resistance, hardened mating material favorable. It is especially suitable for toggle mechanism bushing in injection molding machines. Some standard parts are SPB, SPF, SPFG, SPW, SGF, SGB, SWP, SLP, SLC, SLI, JEGB, JNA, JESW, JSPW etc.. 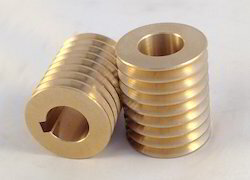 This type brass bush is widely used in continuous casting rolling machine, mining machinery, shipping machinery, turbine, injection machinery, auto mold and so on. Copper Bush is designed in compliance with the global standards of the industry. Our expertise in the industry is supporting us in offering the facility of customization to our customers according to their industry specific requirements such as type of metal, size and others. Bronze and brass bushes are used extensively in laminated spring eyes and shackles. These bushes have to endure various loads and stresses. Our spring bushes, made of the right material are equipped to endure this very well. We provide these bushes with perfectly designed and machined grooves to retain oil for lubrication. 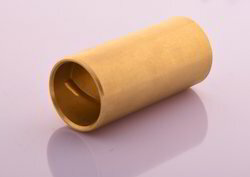 Brass Sleeve Bushing is made from Carbon steel 1045 with zinc plating. No any heat treatment is made on it. Tolerance can be considered as +/-0.01mm. Its application area are Home appliance equipment, Auto parts, Industrial equipment, Electrical equipment, mechanical parts, hardware parts, computer components, electronic instrument components, communication equipment, sporting equipment, optics instrument, lighting equipment etc. 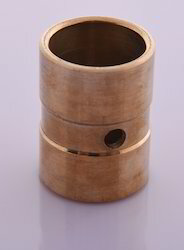 Thin Wall Bearing, Centrifugal Cast Phosphorous Bronze Bearing Cast Brass Bushing is made of high strength brass or other material based on your choice, lubricating by oil added in the oil grooves. 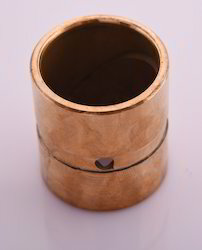 This type cast bronze sleeve bushing has the good performance, high load and long service life. It's also called cast bearing, brass bush, cooper bearing, solid sliding bearing, oil grooves plain bearing, cast bronze bearing, cast bronze, cast brass bushes, cooper bearing bushing and so on. 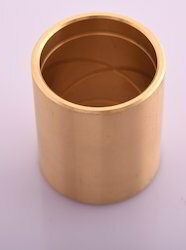 Mainly C86300 or other Brass is used to make metric Casting Bronze Bushing. We are manufacturing finest quality of compressor bushes. 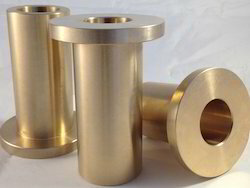 We make compressor bushes from brass material or aluminum bronze material as per customer requirement. We manufacture compressor bushes different size as per customer requirement and industries requirement. These bushes should be use in refrigerator compressor, air compressor and other compressor. We manufacture compressor bushes in compliance with the set industry norms and standards.